· Make the most of your practice time. · Enhance your martial art workout. "I have been reading through your book... It's the best explanation of Kung Fu San Soo... You have done a great Job! It has my highest recommendation..."
"Brings new understanding and insight to the study and practice of Kung-Fu San Soo... A Must Read for all Martial Artists. Not only did I like it... I loved it!... Our concepts have never been explained so well." "All I can say is WOW!!! I love the layout, the straight forward language and the exploration of understanding. I read it, enjoyed it and recommend it to every serious student of KFSS who manage a growing library of material. ... It is a pleasure to read thoughts, remarks, historical notes and deep foundational ideas of our art." Make the most of your practice time. · Enhance your martial art workout. · Improve your mental focus · Increase your technical proficiency · Build your confidence a self improvement tool for the serious martial artist. Comes complete with photographs and diagrams. Practice makes perfect and how you approach your practice, drills and workout is of the utmost importance. Master Paul H. Borisoff, has taught one the the finest martial art systems known to man. The knowledge and wisdom of his 42 years of experience offering professional self-defense instruction is now available to you in this 65 page book. Although not primarily a how-to-book, The Mastering of a Combat Art is a self improvement tool for the serious martial artist. Comes complete with photographs and diagrams. 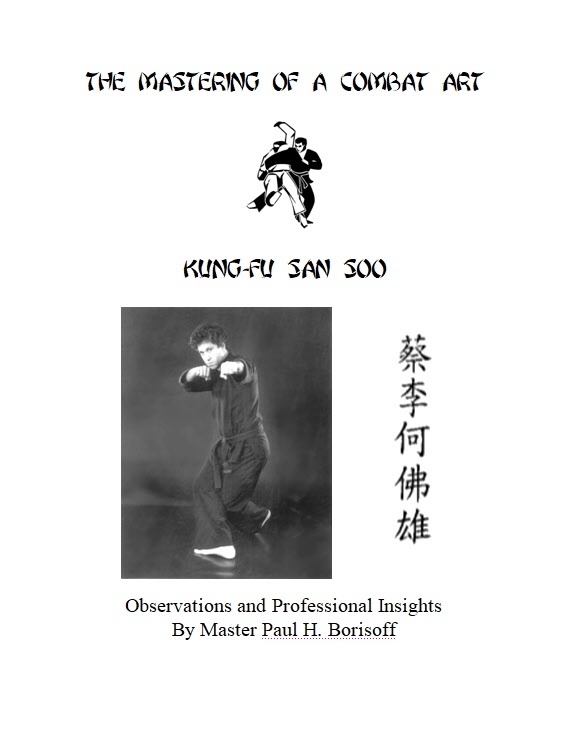 This is a Must-Read for the Kung-Fu San Soo Practitioner in particular, but offers a lifetime of wisdom and insight to students of all martial arts disciplines. To offset the cost of paperback binding at this time, this book is currently being offered in a 8-1/2" x 11" presentation folder (see photo). The paper stock is 20 lb, 3 hole-punched and it is laser printed. It is copyrighted and may not be reproduced without permission from the author.